What do Modest Mussorgsky, Marshal South, a full moon and I have in common? Perhaps nothing except this story, but we did all spend an interesting night together recently on Ghost Mountain in the Anza-Borrego Desert. Let me explain. Modest Mussorgsky was a great 19th century Russian composer. For most Americans, his best known work is probably "Night On Bald Mountain". It has continued to capture the popular imagination since it was featured in Disney's Fantasia in 1940. As a child I was convinced that hideous winged demons of the night ruled lonely mountain tops, and were able to summon up the ghost spirits of the dead to terrorize and torment the living. To this day it is impossible for me to listen to the piece without such visions. Marshal South was an eccentric writer who moved to Ghost Mountain with his artist wife in 1932. He and Tanya were well educated, but because of the Depression were forced to begin a new life. During the next 15 years they would build a house, raise three children and live as close to nature as they could without losing touch with the world. The principal source of income for the few items they did buy came from articles Marshal wrote for Desert Magazine (1937-1985). Stories about his family and their experiences appeared frequently during those years. The ruins of their home ("Yaquitepec," or "Home of the Yaqui") still bears somber and lonely testament to their years there. The full moon is its own complete story, but was needed to complete this one. Here is where I come in. 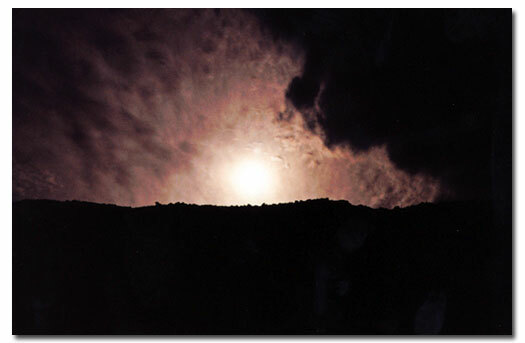 I thought it would be interesting to camp on Ghost Mountain on a full moon night and read stories by and about Marshal South while listening to "Bald Mountain." Sound weird? Well, it was. My initial interest in Ghost Mountain had nothing do with Marshal South. While camping alone in the area 15 years ago some strange things happened to me. They will hopefully be the subjects of another story. At any rate, I was so impressed with the experience that I began to research the area and discovered that I had camped at the foot of a place called Ghost Mountain. While searching for the origin of the name, and any accounts of ghostly activity, I found references to ancient Cahuilla legends of ghosts who were said to inhabit the mountain. In order for a would-be story to seem real, I felt two conditions had to be met. First, the content would have to be confined to what I experienced that night, and to what I already knew. Second, the story had to be written just where it happened. (If anything happened.) I would take everything I would need with me. Beside a full backpack, I would take a camera and tripod, a small tape player with a recording of Night On Bald Mountain, two stories about Marshal South and a piece he wrote while in residence at Yaquitepec. Those were the only rules -- after that, whatever happened, happened. I started up the meandering mile-long "walkway" to Yaquitepec at 4 pm. It was windy, but not unpleasant. 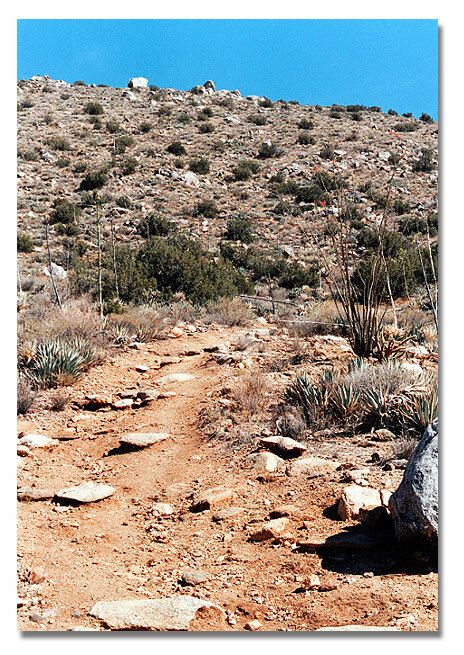 The trail is loose rock and dirt, with frequent switchbacks which cut through hillsides of agave, mescal and juniper. A look back from the first bend accords a wonderful view of Blair Valley and the mountains to the west. It is somewhat startling to have such a commanding view after climbing just a few hundred yards. After about 20 minutes the trail crests at a ridgeline and bears to the north. At this point, Imperial Valley flies into view to the east. Although it usually appears hazy and washed-out from this vantage point, the depth, distances and scale are still impressive. To the south the radical tilt of the terrain seems to spill the Vulcans and surrounding landscape onto the valley floor far below. These vistas take away what little breath is left and offer the hiker an excuse to rest. The last leg of the hike leads to a pile of granite boulders another quarter of a mile up. From down below, this knob is invisible. In a saddle behind it sits the remains of the house. 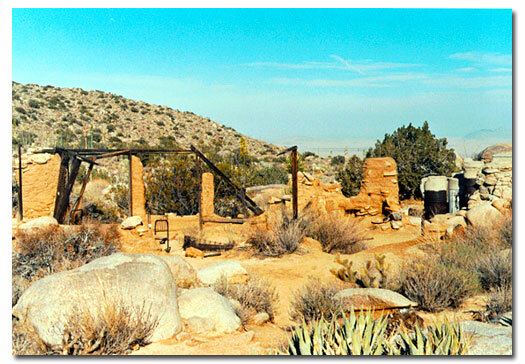 The terrain suggests that the house should be higher up the ridge, so it is a surprise when the ruins suddenly appear. 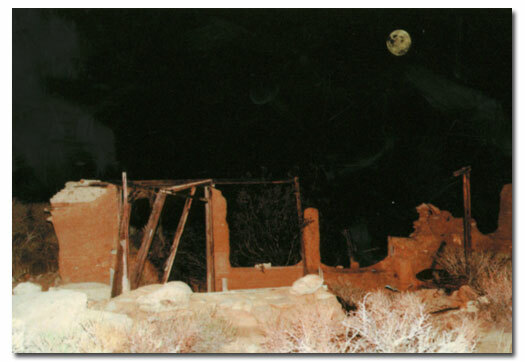 The crumbling adobe chimney appears first, then the rain barrels, then the old rusty-brown bed frames. This is Yaquitepec, a silent and sedentary ghost, but majestic even in ruin. Though the roof and most of the walls are missing, the remaining window frames lean in on themselves, and although the hearth has not been warm in over 50 years, I got the sense that I had walked into someone's home. I even had second thoughts about camping on the site -- I did not want to trespass. But soon, the sheer magnitude of the view and surrounding spaces put things back into perspective. I explained out loud to the South family who I was and what I intended to do. The only response was the hush of the wind through the juniper. I set my pack down and looked for a place to pitch the tent. I was about to take a big gulp of water when I gazed upon the catchwater system with its series of concrete-lined basins, ollos, gravity pipes and barrels. Water had always been at a premium here, so for the sake of good manners, I drank sparingly. Everything looked dry and baked out. Even so, a few ocotillo waved their red flags in the ceaseless breeze, and a dozen swaying green agave stalks supported clusters of little upside-down banana-like pods. It took only a few minutes to set up the tent. That done, the realization of being alone quickly set in. The moon would not rise for another 3 hours, and there was really nothing that needed to be done. The senses seem to become more acute when the body is idle. I noticed that there was no smell of any kind. Could the wind blow smells away? During the lulls, when the wind decides which way to blow, does the faint, high-pitched tone one hears comes from inside the head or from outside? When the wind kicked up again I wondered if the wind eventually blows everything away -- maybe it had blown the Souths away. Time for me to get up and move around. I climbed up on a rocky promontory and nestled down among the rocks to get out of the wind. The only sign of life was a dwarf barrel cactus rooted in a crack at the base of a granite slab. It was growing nearly sideways and seemed to be holding the slab up all by itself. I leaned back and gazed east toward the Imperial Valley. It was veiled in a smoke-like haze as if receding into the dim past -- the past of ancient Lake Cahuilla, Spanish explorers, wagon trains and stagecoaches. The distant desert floor was sculpted like a chute that seemed to draw both time and space past the base of Ghost Mountain and on out to the west. Eventually, I too was drawn in that direction and walked over to the other side of the mountain to follow the path of the sinking sun. The view to the west unfolded in bold contrast to that to the east. There was more color, more sense of depth and more detail. Sandy roads and washes conveyed a sense of activity, purpose and direction. There was just enough detail in the far away features to impart a sense of curiosity and optimism. Early travelers and pioneers must have felt that as well. But here on Ghost Mountain time seemed to have stopped -- it was as if the past and the future existed simultaneously in a milieu without humans. Everything seemed to offer itself up to this place. It is certainly not the highest point around, but everything seemed to be below it. The higher peaks bowed and pointed to it. The foothills and sands reached up to it. As the sun set it became the whole world. At dusk it began to work its magic. The wind ceased for a moment, leaving the sun to warm me with its last rays. Birds and insects from nowhere erupted into a busy chorus of chirps, buzzes, flits and flitters. One plump little blue-chested bird landed near me and looked at me as if to say, "What are you doing up here?" I had no answer for him. As I shifted my gaze between east and west for photo possibilities, I had to do a double take. I saw what I thought was a large Indian male sitting on rock slab about 150 yards up slope. I almost missed my sunset picture looking at him. I waved just to be safe, but decided he was just shadows. When I turned back there was not even a shadow to wave to. Dark was closing in, and it was getting a little cool. I decided to go inside the tent and read the articles I had brought while waiting for moonrise. Under the dull light of my candle lantern I read two stories about Yaquitepec from old editions of Desert Magazine. I was just finishing a story South had written for the May 1946 issue when the glow of the floating yellow moon shone through the roof of the tent. I scrambled to where I had set up the tripod and began snapping away. I pushed the play button on the recorder, then went back to shooting. When the prelude to "Night On Bald Mountain" began I jumped, and thought instantly of winged demons. I carefully scanned the area with my flashlight before returning my attention to the camera. After taking dozens of pictures I decided it was time to relax a little. I had brought an ounce of brandy with me, so I mixed up a watered-down nightcap in my Sierra Cup. I lifted it toward the moon and offered a toast: "To Modest, Marshal, the Moon and Me". I decided to go back inside and finish the article I had been reading. I rewound the tape and played the song again. At 10:30 I was ready to turn in, tired but content. I lay back and closed my eyes -- the wind sounded like surf. I was about to drift away when I heard what sounded like the closing of a wooden door. "That's weird," I thought. "There aren't any doors left on the house ... must be the wind." A few moments later I heard the faint, soft sound of a woman's voice coming from the east side of the tent. I heard other voices on the west side, near the house. The tones were normal, as if in casual conversation, but there were no words, or anything that resembled a language. There was nothing frightening about the voices, but I would hear them once again before the night was over. I was able to convince myself that it had all been the wind and my imagination, and rolled over to go back to sleep. At that point I heard three or four high-pitched staccato thumps that sounded as if they had been made by a toy drum. I only heard the sound once, but it was enough to make me wide-eyed and tense. As I gazed up at the roof of the tent I saw a vision that terrified me. When I realized what it was I laughed out loud. The roof of my tent is made up of six wedge-shaped panels whose pointed tips meet at a small triangular panel. The wedges alternate between black and white. In the center of the triangle two bright stars shone through like eyes. The driving wind had caused two of the black panels to flap like wings. The hideous hovering beast was none other than the evil Chernabog, from Fantasia! Greatly relieved at having unmasked him, I had no trouble convincing myself that all of the strange things I had seen and heard had been the products of my overactive imagination. With that I was able to drop off into a deep and grateful sleep. When I awoke the moon was still high and bright in the west. I got up just in time to take some pictures of the new morning sun as it broke over the mountain. I set the camera up in the house and shot through the east window frame. I smiled as I thought of all the beautiful sunrises the Souths must have seen through that same window. Morning at Yaquitepec was glorious, and I was glad to be there. 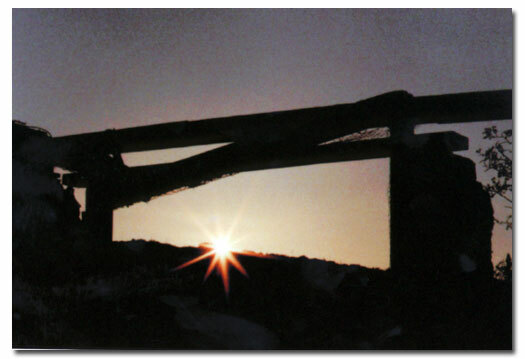 "There is a long enthralling story in all of these old, old dwelling sites. One has only to tread reverently and let the shades of the dead years re-tell it....we knew that we were not alone. That not anyone is ever alone. That the whole universe -- the past and the present -- is held firmly together like beads upon a string. A string that is the love and the infinite mercy of the Great Spirit. And in that realization there is a secure and abiding Peace."